Key findings: A gap analysis showed that the regional network of PAs and IBAs meets conservation targets for over half of the ecoregions represented, but does not conserve any of the East Saharan montane xeric woodland or Mandara Plateau mosaic ecoregions. Conservation targets are met for the majority of species, but some conservation features remain completely unprotected, especially for threatened species. To meet all the conservation targets, over 20% of the West Africa region would need to be protected. The national gap analyses showed that there is high variability among countries, with the existing network of PAs and IBAs meeting most of the conservation targets in some countries, but failing to conserve a number of conservation features, such as particular ecoregions and important species for conservation in other countries. Systematic conservation planning (SCP) is the most widely used approach for designing and improving PA networks. It involves producing a list of important species, habitats and ecological processes (collectively known as 'conservation features'), mapping their distributions and setting targets for how much of each conservation feature should be protected. 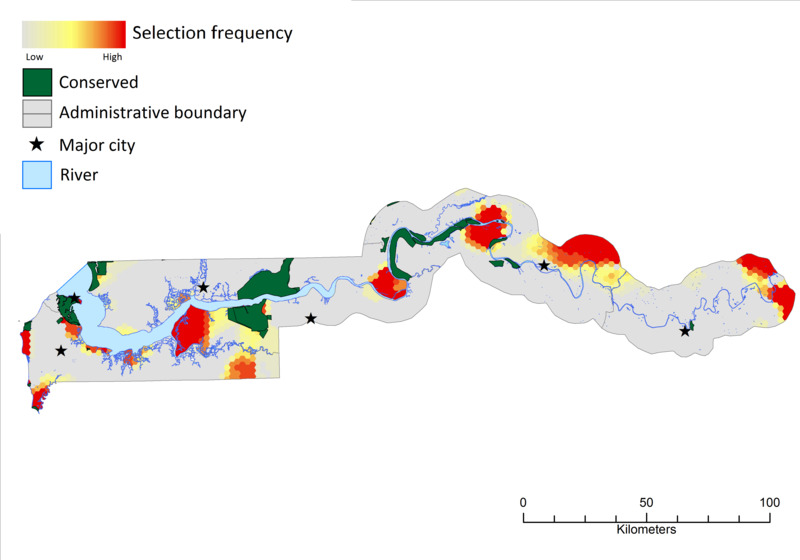 These data are then used to carry out a gap analysis, which measures the extent to which the existing PA system meets these targets, and a spatial conservation prioritisation, which identifies priority areas for filling any target shortfalls. PA networks also need to be robust to the impacts of climate change, as the distributions of the conservation features are likely to shift in response to changes in temperature, rainfall and sea levels. SCP can be used to address this issue by identifying priority areas for conservation that protect both the current and the future expected distribution of important species. In this study, the Durrell Institute of Conservation and Ecology (DICE) from the University of Kent carried out a gap analysis and spatial conservation prioritisation for the West African region and the five project countries: Chad, Gambia, Mali, Sierra Leone and Togo. This involved producing one regional and five national systematic conservation planning systems. These systems were then used to help identify ways in which PA networks could be improved to conserve biodiversity both now and in the future, taking into consideration future climate projections. The systematic conservation planning system for West Africa contains data on all 17 natural land cover types, 28 ecoregions, 171 amphibian species, 884 bird species and 230 mammal species found in the region. It also contains data on the predicted distributions of 316 amphibian, bird and mammals species that are listed as Threatened on the IUCN Red List and/or have been assessed as being vulnerable to the predicted impacts of climate change, based on Species Distribution Models (SDMs) for the time period 2010-2039. The West Africa planning region has an area of 7,311,000 km2 and 12.6% of this falls within existing PAs, while another 1.1% falls within unprotected Important Bird and Biodiversity Areas (IBAs) that have been identified by BirdLife International and their local partners. The percentage of each country that falls within PAs or unprotected IBAs ranges from 1.1% for Mauritania to 34.8% for Guinea-Bissau. Only seven of these countries would meet their Aichi target 11 if their IBAs were also included in their PA network. The regional network of PAs and IBAs meets conservation targets for 15 of the 28 ecoregions, but fails to conserve any of the East Saharan montane xeric woodland or Mandara Plateau mosaic ecoregion. 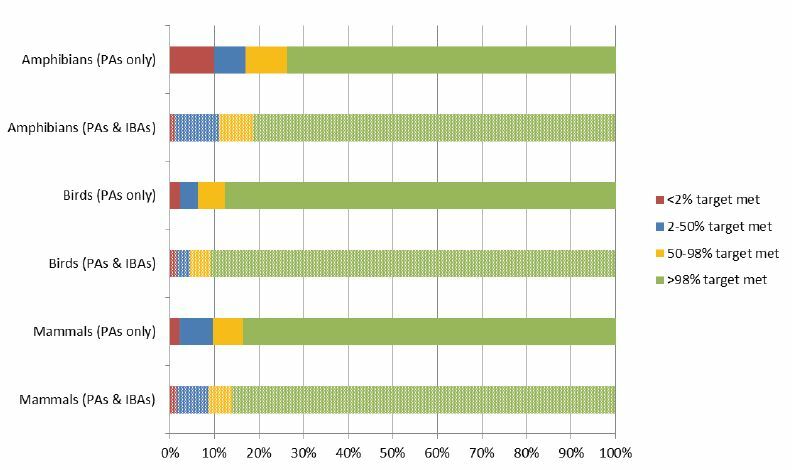 The combined network of PAs and IBAs meets targets for 89.5% of all conservation features. Conservation targets are met for 81.3% of amphibian species, 90.8% of bird species and 86.1% of mammal species and for 94.0% of the SDMs in 2010-2039. However, over 7% of these features are completely missing from this network and this percentage is even higher when considering threatened species, where 12.5% are currently unprotected. Percentage of amphibian, bird and mammal species for which the set target (i.e., proportion of their current distribution range to be protected) is met by the existing Protected Area (PA) network and Important Bird and Biodiversity Areas (IBAs). The PA and IBA network is more effective at meeting targets for the future predicted distribution of species in 2010-2039, although 0.8% species of birds and 0.25% of mammals are completely unprotected. In contrast to the findings for the current distribution of species, the future distributions of threatened species are better protected than non-threatened species. We used the Marxan conservation planning software to identify priority areas for meeting the conservation targets. The analysis was designed to avoid areas of high human population density, where possible, and to identify priority areas that extend existing PAs or are large enough to be ecologically viable. The results of the analysis shows that meeting all the conservation targets requires an additional 384,765 km2 to be added to the existing PA network, which corresponds to protecting 21.6% of the region. The priority areas that were most consistently identified by Marxan were scattered throughout the region, but the most extensive areas were in Côte d'Ivoire, Ghana and Mauritania. For Côte d'Ivoire and Ghana, this was because they contained important biodiversity, but also because they contained many small PAs that Marxan sought to link. 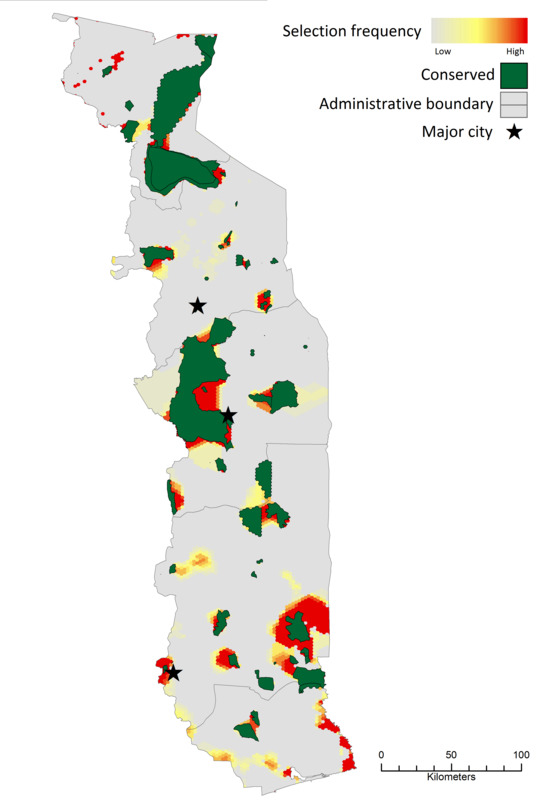 For Mauritania, the large extent identified results from the relatively low PA coverage in the country, meaning that some ecoregions require higher levels of protection to meet the specified targets. Priority conservation areas for West Africa. Areas shown in red were the ones selected most frequently by Marxan. The results from the gap analysis and the spatial conservation prioritisation can be used to inform conservation policy and practice in West Africa. However, caution is needed when implementing the results because most of the distribution data were based on range maps that include some unsuitable habitats. Thus, the first step in the practical use of these results is to carry out literature reviews and field surveys to check that each priority area is genuinely important for the conservation features for which it was selected. It is also important to recognise that the West Africa conservation planning system only contained data on three groups of vertebrates and did not include data on a range of factors that might influence implementation, such as ecosystem services, opportunity costs from agriculture, or land-use plans from other sectors. Thus, it is important that national and international researchers and conservation practitioners continue to improve the planning system by updating and adding new data. Smith R.J. 2015. West Africa Gap Analysis and Spatial Conservation Prioritisation. UNEP-WCMC technical report. The national planning systems were developed as a collaboration between DICE University of Kent and national experts through a series of national workshops, in which biodiversity experts were taught how to carry out gap analyses and developed conservation planning systems for their countries. At these workshops, initial results from the national planning systems were presented and the outputs were refined by the participants so that they could be used to inform conservation policy and practice. The participants helped set all conservation targets (how much of each conservation feature should be protected), and agreed on areas to be excluded from the set of priority areas (for example because of urban development or mining operations). They were also involved in checking fragmentation levels (to ensure a minimum size for the creation of new PAs) and in identifying a set of priority areas for meeting the protection targets. The results coming from the planning systems are summarized in a series of reports, which describe for each project country, how each of these planning systems was developed. The reports include details on how the planning systems were used to measure the degree to which each country's current PA network meets conservation targets, and to identify priority areas for expanding national PA networks. The Chad conservation planning system classified 149,636 km2 (11.8%) as being already included in PAs and 30,373 km2 (2.4%) as being in currently unprotected IBAs. The current Chad PA and IBA network is meeting most of the conservation targets set. However, it is failing to conserve any of the East Saharan montane xeric woodland and very little of the Sahara desert ecoregion. Regarding the current distribution of amphibians, birds and mammals, on average, about 80% of these species have met their protection targets in the current PA and IBA system. However, threatened species are less well protected, although the proportion of species where the targets have been met is still relatively high. Most of the identified priority areas are found around existing conservation areas (PAs and IBAs), with smaller priority areas found in patches in the south of the country (Figure 16). The analysis also showed that large areas in the north of the country should also be included in the PA network to meet targets. Priority areas in Chad for meeting conservation targets, whilst avoiding areas with high human population density where possible. Smith R.J. 2015. Analyse des carences et établissement de priorités géographiques pour laconservation au Tchad. UNEP-WCMC technical report. The Gambia conservation planning system classified 422 km2 (4%) as being already included in PAs and 215km2 (2%) as being in currently unprotected IBAs. The current Gambia PA and IBA network does not meet most conservation targets. It is indeed failing to meet targets for almost all species, although the unprotected IBAs are playing an important role in increasing protection for all three taxonomic groups. A number of important priority areas were identified in different parts of the country (Figure 17). These are found from East to West and reflect biogeographic patterns. Priority areas in the Gambia for meeting conservation targets, whilst avoiding areas with high human population density where possible. Smith R.J. 2015. Gap Analysis and Spatial Conservation Prioritisation in The Gambia. UNEP-WCMC technical report. The Mali conservation planning system classified 69,839 km2 (5.6%) as being already included in PAs and 14,501 km2 (1.2%) as being in currently unprotected IBAs. The Mali PA and IBA system is failing to conserve any of the Sahara desert ecoregion and very little of the Inner Niger Delta flooded savanna. Birds are relatively well protected, especially when IBAs are included, but mammals and particularly amphibians are poorly represented. The situation is considerably worse for threatened species, especially for mammals. Most of the priority areas identified are found in the central and southern sections of Mali, in particular around existing PAs (Figure 18). Mali needs to expand its PA network throughout the country to meet conservation targets. 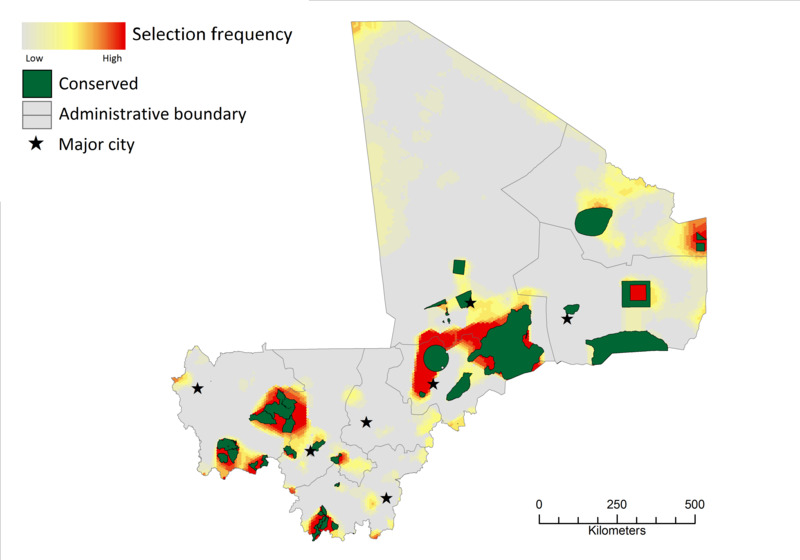 Priority areas in Mali for meeting conservation targets, whilst avoiding areas with high human population density where possible. Smith R.J. 2015. Analyse des carences et établissement de priorités géographiques pour la conservation au Mali. UNEP-WCMC technical report. The Sierra Leone conservation planning system classified 4,211 km2 (5.8%) as being already included in PAs and 512 km2 (0.7%) as being in currently unprotected IBAs. The current Sierra Leone PA and IBA network does not meet most conservation targets. Notably, it is failing to meet targets for almost all species, especially amphibians. Most of the priority areas are found in the central and western sections of Sierra Leone, particularly around existing PAs (Figure 19). Sierra Leone also needs to expand its PA network throughout the country to meet conservation targets. Priority areas in Sierra Leone for meeting conservation targets, whilst avoiding areas with high human population density where possible. Smith R.J. 2015. 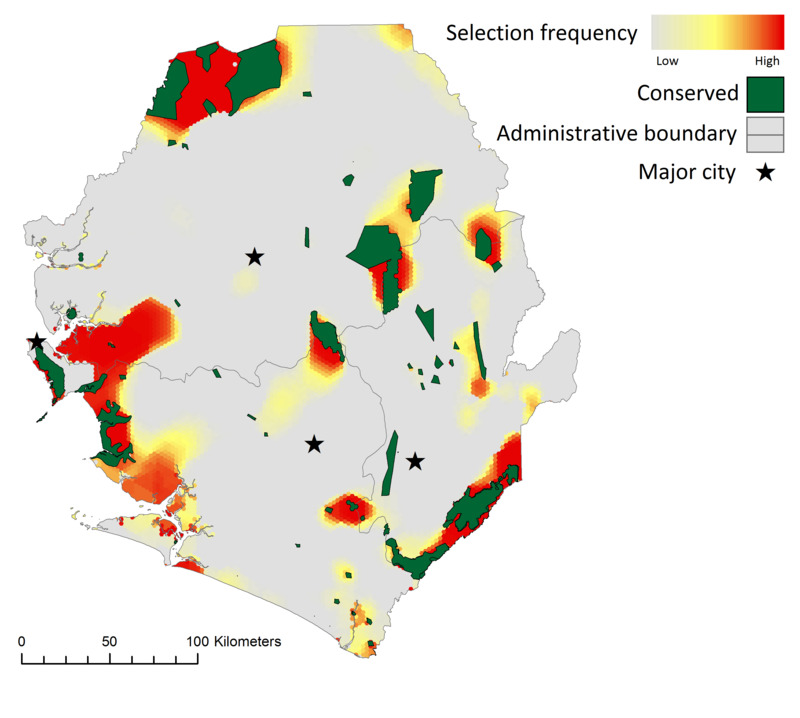 Gap Analysis and Spatial Conservation Prioritisation in Sierra Leone. UNEP-WCMC technical report. The Togo conservation planning system classified 7.273 km2 (12.8%) as being already included in PAs and 151km2 (0.3%) as being in currently unprotected IBAs. The Togo PA and IBA system is representing most of the ecoregions and landcover types. The current network is already meeting targets for most species and only a very small proportion are completely missing from the existing PA network. However, it is worth noting that Togo's PA network is currently being revised. A small number of priority areas have been identified outside the existing conservation area network (Figure 20). However, there is still a need to expand the existing PA network in order to meet all the conservation targets, notably with some additional areas in the south. Priority areas in Togo for meeting conservation targets, whilst avoiding areas with high human population density where possible. Smith R.J. 2015. Analyse des carences et établissement de priorités géographiques pour la conservation au Togo. UNEP-WCMC technical report.